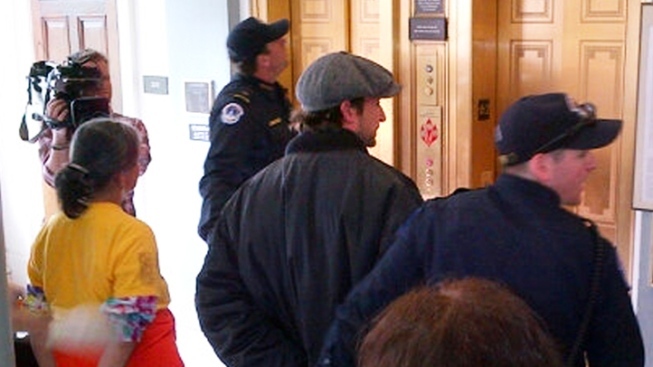 Handcuffed actor Noah Wyle on Capitol Hill Monday. Former "ER" star Noah Wyle and more than 100 members of the group ADAPT were arrested during a Capitol Hill protest to urge Congress not to cut Medicaid. Wyle and members of ADAPT said any cuts in Medicaid spending would force people with disabilities and the elderly out of their homes and into nursing homes to get the services they need. Wyle's arrest follows a few weeks after his former "ER" costar George Clooney was arrested at the Embassy of Sudan where he and other protesters were demanding action to stop Sudan's blockage of food and humanitarian aid. ADAPT is in Washington for a "national action" through Thursday.